I’m asked quite frequently by parents: Why does my baby keeping waking up throughout the night? Of course, with Google at our fingertips, none of them are short of hypotheses. Are they regressing? Are they sleeping too much throughout the day? Are they sad? Are they hungry? Sick? Uncomfortable? While any of these are possible, and it’s important never to simply shrug off your baby’s inability to sleep for extended periods of time, there is something important to keep in mind – a baby’s body, which affects their sleep, is very complicated. It’s changing at a rapid rate, transforming the way they feel, the way they relate to the world, and how their minds work. It’s an exciting time of their lives – if not also nerve-wracking sometimes for us parents. Ultimately, this deeply impacts their sleep, and as badly as baby needs sleep, there’s plenty to get in the way. Let’s take a closer look at a few of the reasons and what you can do. As a baby’s sleep cycle starts to become more complex. When they’re first born, they don’t sleep very soundly (which is why they’re so easy to wake up). When they start sleeping more deeply, including the much-needed REM sleep, they briefly wake up when they make the transition. This actually happens with us adults, as well – we’ve just learned to fall back asleep before that happens. Baby hasn’t realized this. When she wakes up, everything is dark, her mother and father are gone, and she is all alone. Naturally, she cries out. This is where the term “self-soothing” comes from. 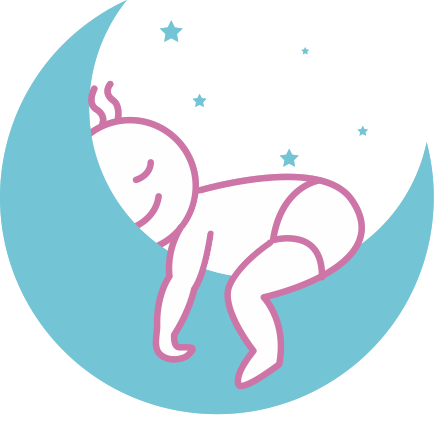 It’s not a comfortable notion for any parent, but allowing your baby to learn how to soothe themselves back to sleep is important for teaching them (or, more accurately, allowing them to teach themselves) how to sleep through the night. Of course, that doesn’t mean that you should let them cry for extended periods of time, and no one sane would ask you to do so. But generally, letting your baby cry for a few minutes to encourage them to fall back asleep naturally will help them learn that they can do so in the future. Generally, the state of our mind between wide awake and asleep is controlled by two hormones: cortisol and melatonin. Cortisol stimulates, melatonin calms. For all of us, including us adults, our sleep is regulated by these two hormones. In fact, it’s these two chemicals that regulate our circadian rhythm and why we experience jet lag. When our body is used to a certain cycle, telling these hormones to release at certain times, any disruption to that cycle can completely throw off our ability to feel awake when we should be awake and fall asleep when we should fall asleep. For baby’s this disruption can be even more pronounced. If their sleep times get off by even a little bit, then they end up struggling with sleep. The effects of melatonin only last for a period of time (which is something night owls know quite well) and then wear off, making it harder to fall asleep. Also, if baby doesn’t fall asleep after this melatonin effect, their bodies might think there’s something wrong, something dangerous that’s keeping them awake – which causes their brain to secrete cortisol. Not good! If your baby starts to get energetic when they’re supposed to be doing the opposite, this is likely the problem. But this chemistry problem can cause problems in another way, too: Our bodies generally start secreting cortisol a few hours before we wake up. As with the previous point about changing sleep cycles, when a baby wakes up because of this jolt of cortisol, they aren’t used to just falling back asleep. They stay awake, they cry, and then you wake up, you cry… you get the point. The easiest solution to this problem is keeping a consistent sleep schedule for your little one. Variance in their bedtimes can make it difficult for them to establish good habits. So use the wonderful power of melatonin to help you get baby to sleep at a consistent time every night. Beyond that, get your baby lots of sunshine throughout the day, which helps stimulate her melatonin production come nighttime. As has been well established in this article, babies are not so good at falling back asleep when they wake up. They also have very sensitive, quickly changing systems and their brains don’t yet know how to deal with that. Because of this, it’s vital that you remove distractions when baby is sleeping. I know that seems obvious and is one of the first things we think about and pay attention to, but it can be sneakier than you think. One of the biggest distraction doesn’t even happen when your baby is trying to fall asleep but actually before. When your little one is looking at screens, including TVs, phones, tablets, or whatever else, this stimulates cortisol production in the brain. Our brains don’t understand the difference between this type of light, which is unnatural, from natural sunlight that it uses to regulate moods based on time of day. So try to completely avoid screen time for an hour or so before bedtime and there’s a good chance it will have a positive effect. Being a parent is a tough job! Whenever your little one struggles with their sleep, it’s easy to wonder if you’re doing something wrong – especially if you’re new to this whole thing. Take ease in the fact that, most of the time, there’s nothing serious wrong and a few tweaks to your routine, along with some patience, are likely to get your baby sleeping silently through the night. If you feel stuck and need help, don’t hesitate to reach out! Head over to my contact page for ways to get in touch!